Images are the part of every attractive, beautiful structure and design you see in multimedia nowadays. Even images are the first priority and watchable media usually on multimedia because it is very lighted as compare to other media. We usually share Images on social media like Facebook, Instagram, WhatsApp, and others. There are a variety of images, or in other words, there are many types of Image file formats such as GIF, PNG, JPEG, BMP, PNM etc. These formats tell us about the usual quality and the brief of the image that where the images can be used or where it can perform best. Images can be used for fun or for Profession as well. Images are the editable media on which you can make changes right over to the previous one. You can add text to it, add other images over it, adjust the brightness of different types, but that’s all something you can easily do with the existing image. But one of the advanced changes people wanna make on images is making them transparent. This can only possible with photoshop or similar software like that which can be used on PC/laptop. But we are living in the internet world where all services are online. Because we don’t want have time to install some expensive and exclusive software on our system. Also, software like Photoshop needs more than just a normal practice to make such changes on images. Another reason for not using these software is they are work only on personal computers or laptop which can’t be available everywhere. Such cases bring us or forced us to try online tools to Make image Background transparent online. Since these are online and web-based tools so they can be used through a PC or through a mobile device which is a Handy feature of these online tools. Visit Lunapic sites page to make for transparent changes, using this link. On this page, you will see the option to Choose file or Open URL. So if you have that images on your computer/system then simply upload it by clicking the Choose File option. Or if you wanna make changes to images you have just seen somewhere on the internet then simply copy the image address and paste it into the second option box on Open URL and press Go button. After Uploading the image you will see the image in the next window of Lunapic. Here you can make changes on images and edit it. Lunapic transparent area where you have just upload the image is already set to make the uploaded image transparent in a single click. This default setting on this page works in most cases. However, if it won’t work for you, then simply adjust the transparency setting according to your needs. But for now Click on the image. On the next windows, you will see the image you have uploaded is now fully transparent. The background area of the image will not be visible. And you can use the image as a logo also. There are other similar services on the web which you can use to make image background transparent online. By Using ClippingMagic you can do similar task as Lunapic but you can make more adjustment/changes to make the finest transparent image according to your needs. You can import image here from your PC through upload image button or you can drag and drop over the site upload area. Even simply if you haven’t downloaded the image yet then copy the image URL and paste on the site to make it transparent. ClippingMagic gives you the maximized options to make transparent changes to your uploaded image. On the next window, you can use the Foreground and Background brush to remove the background area and make highlights to your image. You can make other edits with that as well. After done making transparent changes on the background you can download the images from there. 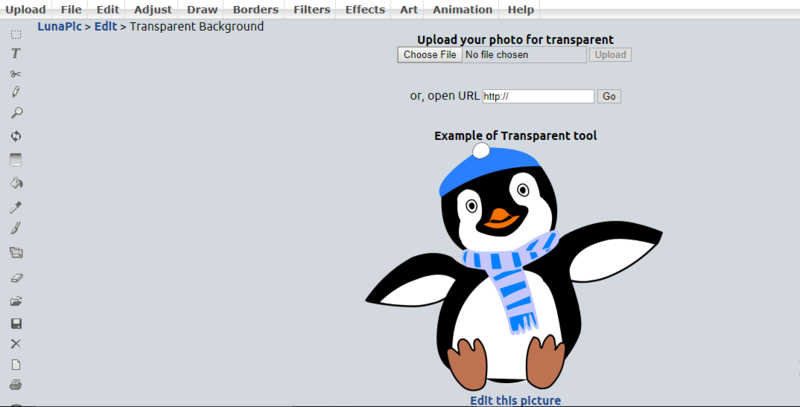 This is another simple and basic free image editor which you can use to make image transparent. Similar to above-given options you can import the image you wanted to be transparent and make the desired changes to it. Also, making other image edits and adding other effect is simple with an Online image editor. Conclude: These three above given tools to make the image background transparent without any cost. Its easy, simple and no tedious task of installing software. You can access these tools using any browser on your computer or mobile device.